SAP ABAP - Hashed Internal Table (Partial Key Access) With Example. 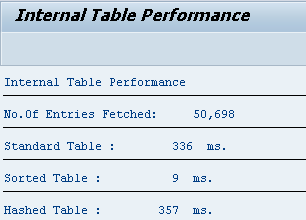 Comparison between Standard, Sorted & Hashed internal tables & it's performance. SELECT * FROM skb1 INTO TABLE st_skb1. WRITE: /'No.Of Entries Fetched:', sy-dbcnt. CLEAR: wa_skb1, v_time1, v_time2, v_time_f. GET RUN TIME FIELD v_time1. READ TABLE st_skb1 INTO wa_skb1 WITH KEY bukrs = p_bukrs. GET RUN TIME FIELD v_time2. v_time_f = v_time2 - v_time1. WRITE:/ 'Standard Table :', v_time_f, 'ms.'. CLEAR: v_time1, v_time2, v_time_f, wa_skb1. READ TABLE so_skb1 INTO wa_skb1 WITH KEY bukrs = p_bukrs. WRITE:/ 'Sorted Table :', v_time_f, 'ms.'. READ TABLE ha_skb1 INTO wa_skb1 WITH KEY bukrs = p_bukrs. WRITE:/ 'Hashed Table :', v_time_f, 'ms.'. Here we can see the comparison of three tables : Standard, Sorted & Hashed. From the output it's very clear that if the key is a partial key of the tables' primary key combinations, then the best way to read tables is via sorted tables. Sorted tables are the most efficient in reading data from internal table on partial keys.